The Sheepfold was almost an afterthought in the design of the park. Original in the plan was a 15-acre open area intended as a parade ground. Once the broad space was cleared and filled with topsoil – the most expensive project in the construction of the Park – Frederick Olmstead and Calvert Vaux convinced the Park Commissioners that a sheep meadow would be more appropriate and romantic. Two-hundred Southdown sheep were introduced to the meadow in 1864. The Sheepfold became necessary to house them. The same day two rams, eleven ewe lambs, one common bull, and one year-old were sold, overseen by “Long Tom” Conway, the Central Park shepherd. Prices ranged from $14 for one of the rams to $2 for a lamb. The buyers were disinterested in the yearling bull. “He was black, with no distinct points or markings, and the only interesting thing in his history was the fact that he was born in Central Park. The buyers were an unromantic crowd, and the yearling only fetched $6, which he ought o be worth for beef,” said The Times. In 1912 Parks Commissioner John D. Crimmins proposed that the Sheepfold be demolished, the flock removed to Bronx Park, and the Lenox Library building – now obsolete with the construction of the New York Public Library – be moved to the site. While the editor of The New York Times agreed that the Sheepfold should be destroyed, it wanted no additional buildings in the Park. “We are indebted to Mr. John D. Crimmjins for the assurance that the unsightly old sheepfold which disfigures the west side of Central Park, near Sixty-fifth Street, is no longer needed,” the paper said. Despite the arguments, the Sheepfold remained. In 1921 Police Commissioner Enright requested an appropriation from the Board of Estimate for $10,062.75 to build a garage “for the storage of its police wagons” at the Sheepfold. Fortunately, the Deputy Controller, Henry H. Smith, was a former Parks Commissioner. Smith had long felt it was a “mistake” to allow the Metropolitan Museum of Art into the Park and refused to admit any further invasion. Parks Commissioner Robert Moses ousted the sheep in 1934 as he developed plans to convert the charming Gothic building into a restaurant. 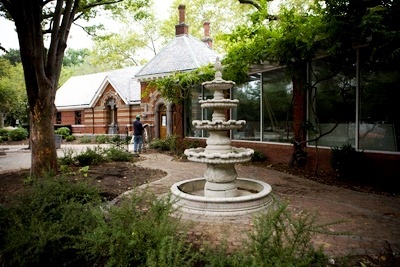 “To make room for Park Commissioner Moses's proposed popular-price tavern in what was once the old sheepfold in Central Park,..the herd of forty-nine pure-bred Dorsets that was formerly quartered there was sent across the East River to join their hornless brothers, the Southdowns in Prospect Park,” The Times reported on May 18. Despite protests from the neighboring Central Park West and Columbus Avenue Association, Moses put CWA workers on a 24-hour-a-day schedule remodeling the structure. Although the moderately-priced restaurant was a success, the building was taken over by the Civilian Patrol Corps a few years later as headquarters, until 1943. At that point the operators of the Claremont Inn, on Riverside Drive, renovated the structure into a year-round restaurant, called Tavern on the Green. With its eclectic and whimsical décor, the Tavern became a must-see for tourists. In 1956 designer Raymond Loewy was commissioned to execute a $400,000 renovation that included the addition of the Elm Room, constructed around a live tree. That sense of theater was obvious when “Bands, balloons, bikinied models and other assorted ballyhoo were served up in Central Park yesterday as the newly refurbished Tavern-on-the-Green opened for business,” as reported by The New York Times on September 1, 1976. The dripping crystal chandeliers, the millions of tiny lights outlining the eaves, and the venerable architecture lent a quirky ambience to the Tavern. Throughout the decades the Tavern-on-the-Green was patronized by movie stars and politicians, musicians and writers and appeared in over a dozen movies and television shows. Despite its rich history and international association with New York City, the Parks Department did not renew the restaurant’s license on August 28, 2009. On New Years Eve a farewell party was held for 1700 guests and then the lights went out forever. Included in the sale were an emerald-colored chandelier made in Austria for the Maharajah of Udaipur, footmen’s dress uniforms, disco balls, 34 brass samovars, two life-sized wooden elks and a Tiffany-glass ceiling that brought $180,000. 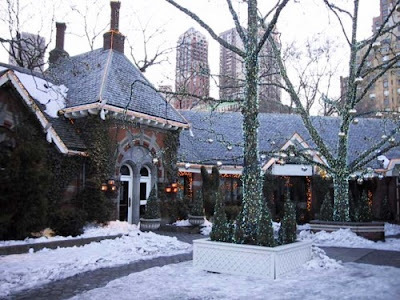 In October of 2010 the Tavern-on-the-Green, once the largest restaurant in America and New York’s highest-grossing restaurant, was transformed into a Visitor’s Center, gift shop and restrooms; along with mobile food vendors. Where celebrities and the wealthy once sipped champagne, tourists now shop for mugs, sweatshirts, posters and t-shirts.